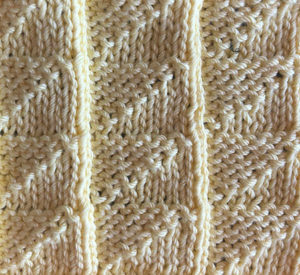 Stitch no 30, aka pennant stitch is the next stitch in my Victorian and 1930’s knitting stitch extravaganza. Another reversible knit/purl stitch, pennant stitch would make a fabulous scarf, or if you knit it in the round, I think it would make some wonderful socks. There are only two more stitches to go! I hope you’ve been enjoying this little series, and the diversions along the way!